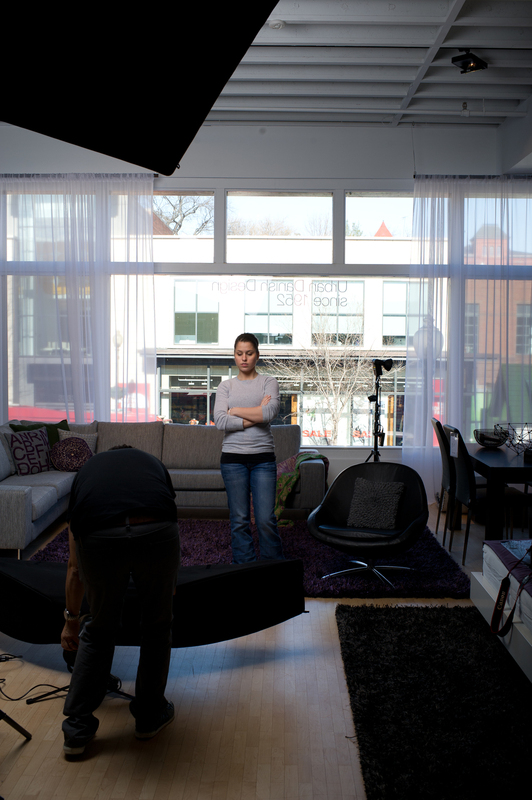 Last week, we did a new shot for my friend Moshe Zusman's new ad for DC Magazine. 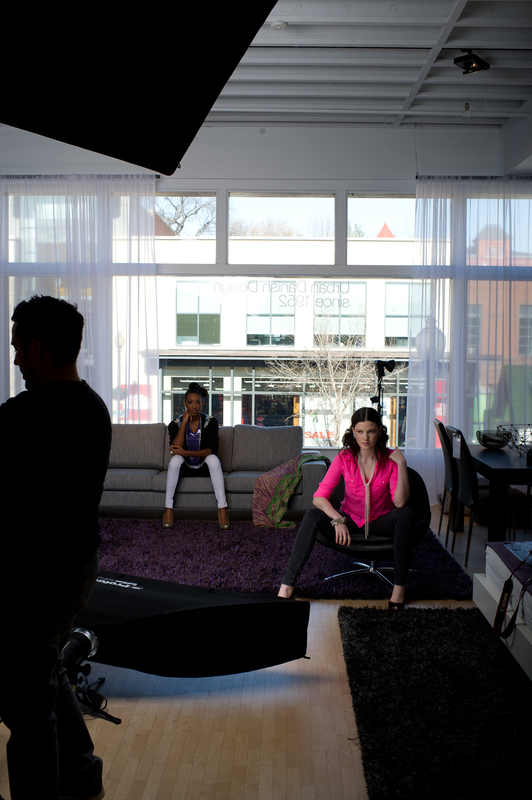 We used BoConcept in Georgetown as a location, as we wanted to have a relaxed, yet modern urban feel to the shoot. The concept was to create an image that looks like he's in the middle of a high fashion style shoot. We needed both the models in the background lit, wanted to see some of Georgetown outside, and even with the sweet Profoto heads lighting the models, we needed to light up Moshe in the foreground in a similar style. So we were balanced outside ambient, indoor ambient, 1000w/s studio lights and speedlights (and a couple of QFlashes too!) This isnt going to be a super long blog post, but I just wanted to go through the steps of starting off with your ambient light and building up the final shot by adding and tweaking the lights. We used Pocketwizard Multimaxes to control which lights were firing during our tests so we could adjust each light independantly to get it to the power and position we needed before moving on to the next light. These images are completely unmodified out of the camera. We started off with approximately what we wanted the framing of the shot to be, locked the camera down on a tripod. We wanted some of the floor and some of the ceiling in the shot, so we went with the Nikon 35 f/1.4 and set the exposure for 1/250th (my max sync speed) at ISO 400 at f/8. This gave us a good starting point to build from and still gave us some flexibility if we needed to open up some shadows (by using a slower shutter speed) or power down the effect of the flash (by closing our aperture more). The sun outside was going in and out of cloud cover, so we knew that if we needed a darker outside exposure, we could wait a few seconds and grab our shot then. Here our beautiful assisstant/model Becca Watkins was our test subject for the power and position for our key light (a 4X6 foot softbox with a Profoto 1000 watt head). Once our key was set to the position we wanted, we powered up the primary fill which was a 4 foot long strip light with another Profoto 1000 watt head. Tweaked the power on the key once we moved some of our subjects that were finished with hair and makeup into the shot. Turned on our fill (lower strip light). You can see how it opens up the shadow under the model's face and adds some serious POP! Brought Moshe in to see what kind of light we'd be working with on him in the foreground, since we had our base light set in the back for the girls. Grabbed a SB900 with a 24" Lastolite Ezybox as a key camera right (similar elevation to our key for the girls for consistancy) and added another SB900 up high on camera right to give him a little kick. Since we had our primary key and fills set, it's time to start popping in some hair lights and kickers to add some tone to the image. Here Moshe is setting the power for one of the three Q Flashes we used in the final shot. 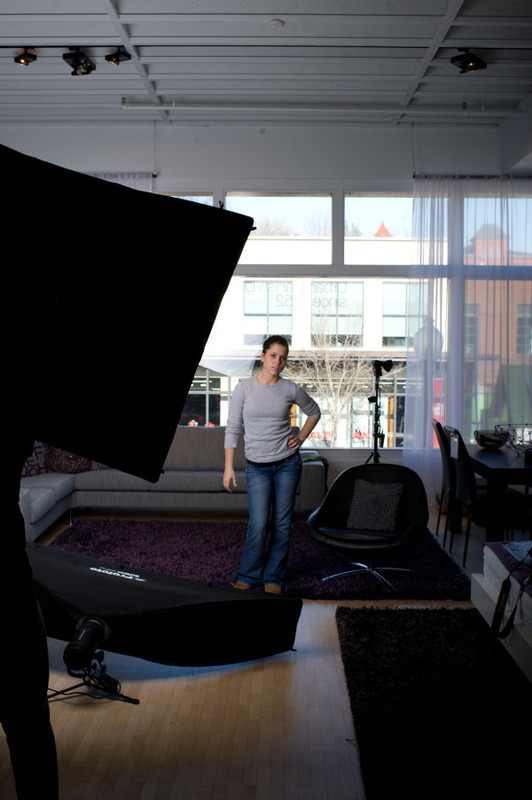 We wanted most of our lights to be visibile in the shot to give the impression that it was a "behind the scenes" image from an actual shoot. Once we had the power set on the main hairlight to where we thought we wanted it, we turned on the other two Q Flashes and out other lights to get a sample of our final lighting setup. you can see that the hairlight/kicker on the right that Becca is adjusting is BLOWING the hair into oblivion. Also the light on the left is causing a little too much flair at the top of Asia's head, so we decided to raise the hairlights and reduce the power a bit on the right side to compensate. Much better height for the lights, now just to dial down the power a bit and we'll be good! Much better balance, hair isn't blown completely out, it has definition and detail. We're getting some nice rim light on our subjects and now it's time to bring in the final "model". Here's the "final shot" with just a couple minor tweaks in Lightroom.